First Kicks is our very popular introduction to football for boys and girls, aged 5 and 6. Children must turn 5 or 6 during the calendar year to be able to play in this grade. Girls turning 7 in the calendar year may choose to play in this grade if they wish to. This programme runs on Sunday mornings between 9.30am and 10.30am. It is based at Raroa Normal Intermediate School, in Johnsonville. The playing teams are 3 v 3 or 4 v 4 and do not include a goalkeeper, using a size 3 ball and on a ground 30m by 20m with goals that are 2 x 1 metre. We endeavour to incorporate all of your preferences and requests when we allocate teams, but it is not always possible to achieve this. We also consider putting children into teams from the same school and of a similar age where possible. Teams will need to select their own team name (consistent with the colour of their shirts e.g. ‘green giants’) before the first game. Coaches and Managers – Like all club activities we are reliant on parents to run the Sunday morning programme. Coaches will be provided with training and coaching plans but will require parents to help with organising activities and assisting with games. Like everything with children this age, the more parents contribute in the sessions by encouraging and supporting the coach and players, the more the children will benefit. Please give consideration to whether you can take on one of these roles. Cancellations due to wet weather or closed field announced on Newstalk ZB Sunday morning at 8.00 / 8.30am, NB listen for ‘Onslow Junior Football Club First Kicks Grade. We also send out a cancellation email to all families to the address you supplied when you registered. 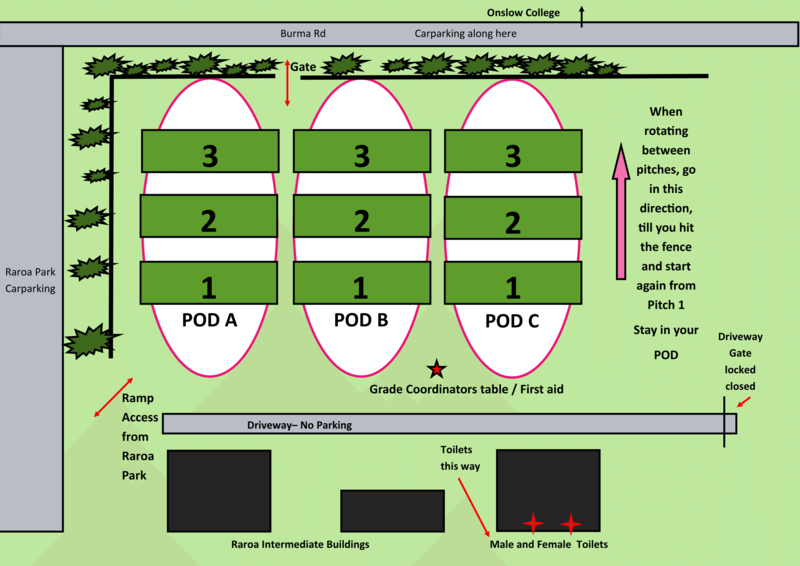 Before 9.30am each team gathers at their designated space on their designated field (this will vary from week-to-week). Pitches are organised into 3 x POD’s. Each POD is graded slightly. A POD is for the youngest players. C POD is for the most experienced teams. We want children to be challenged but not overwhelmed and to enjoy their football. Within each POD are 3 pitches numbered 1-3. You will get a POD letter and Pitch Number ie. A1 or B3. See the map below. Between 9.30am and 10am there will be 3x8min activities with the children rotating around three stations/fields. The coaches focus on a running a single activity (2 coaches/activity), while the Team Managers and other parents will move around with the children. The activities are generally fun games focused around a particular skill. If the coach asks for parental help, please oblige. At 10am we break for ‘half time oranges/drinks’ and then switch to game mode, and the teams will rotate around the same fields/stations and play three 8min games. Parents can help by kicking the ball (gently) back into play from the sidelines – not the ends. There will be a hooter at the 8 min intervals, and a few minutes to get organized between stations/fields. At the end of each game the players will shake hands before moving to next game. At the end of the three games, the coach will debrief and announce player of the day. Arriving at the pitch – Please respect your child’s coach and teammates by being on time, which means arriving sufficiently early to be with the team, kitted up and boots on by 9.30 am, rather than arriving at 9.30am. Unable to play – If you are unable to play please respect your child’s coach and teammates by giving the manager as much warning as possible. Raroa Intermediate building and grounds – Raroa Intermediate has specified no parking on the grass and no smoking anywhere inside the school grounds. We can use the toilet facilities but must leave them as we found them. Please help us to keep these clean. In line with The Onslow Way – The objectives are participation, fun and skill development. Competition is not the focus, which is why we don’t keep score in the games. Thus, during the game, parents are allowed (requested!) to whoop, holler, cheer, applaud and generally encourage their children and their team mates as much as they can, but must never criticise the players or the opposition. Also, if the two teams drawn to play each other are not evenly matched in numbers or there is a big gulf in ability, we would expect players to swap teams to even things up rather than for one team to be running rings around the other. The emphasis is on fun for everyone!